Well, first off, a major thank you to everyone for all the pantry love! As silly as this may sound, having a pantry you love and are proud of just isn't the same if nobody ever gets to see it! I'm so glad I was able to share it and hopefully inspire others to make their pantries pretty too (and without spending a fortune!). I received quite a few questions on the durability of labels once printed. I must say this wasn't on the forefront of my mind, mostly because I'm one of those ADD decorating types who is prone to switching things around every few months. Truth be told, my pantry will probably have newly designed labels by the end of the year, and so having labels to last a lifetime was not my goal. That being said, I did want something that wouldn't wrinkle up in the fridge from moisture (which has happened to other labels I've done). I considered going to Staples and asking them to laminate for me when I remembered that I had this small pack of laminating sheets I bought a few years back. I dug them out of my office organizer, and they were the perfect fit! These guys are supposed to laminate business or membership cards (not quite sure why I thought that was something I needed to do at the time of purchase), but really you could laminate anything with them. Anyways, they are from the dollar store, so for $1 you can laminate 8 labels! 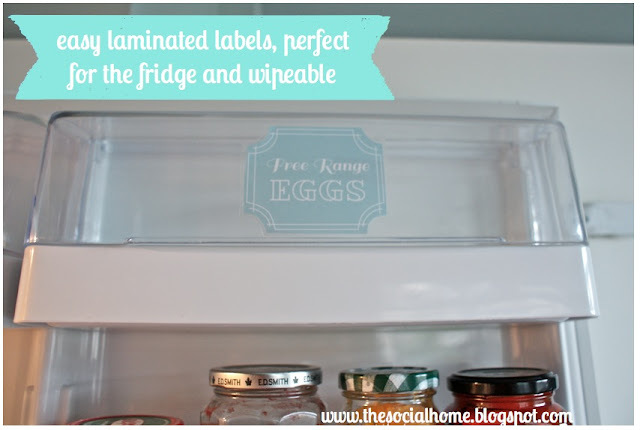 I only used them in my fridge as they don't look quite as pretty as their naked counterpart, but if durability and everlasting labels are your thing, this just might be the solution for you! And for those wondering which super powers I use to cut my labels, well, you're in for a disappointment. I do not have special cutting skills. Just me and my dollar store scissors! I'm actually pretty sure anyone could do a better job than I. 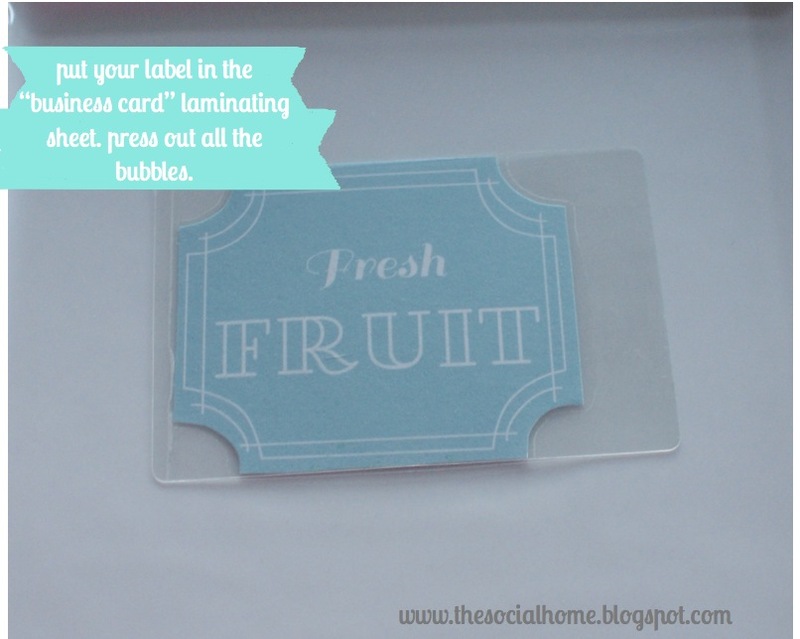 Once your "shape" is cut, you just put it in the sleeve of the laminating sheets, pull off the paper and then stick it all together. Make sure to squeeze out the air bubbles and press nice and hard to make a tight seal. Don't leave it looking like that, though. That's kind of ugly. Whip out those scissors again and start cutting. As you can see, the top and bottom are almost flush with the laminate sheet. I just made sure to leave a small border on the other two sides to make sure it stays laminated and so far, so good. Or you could just use a smaller label. But this works, really! I used my bff the glue runner to stick the laminated label to my fridge, and ta da! If anyone else tries this (or has tried it) please share - would love to know how it worked out for you! I love your labels, do you mind sharing the kind of glue you used? What kind of glue did you use? What is glue runner? 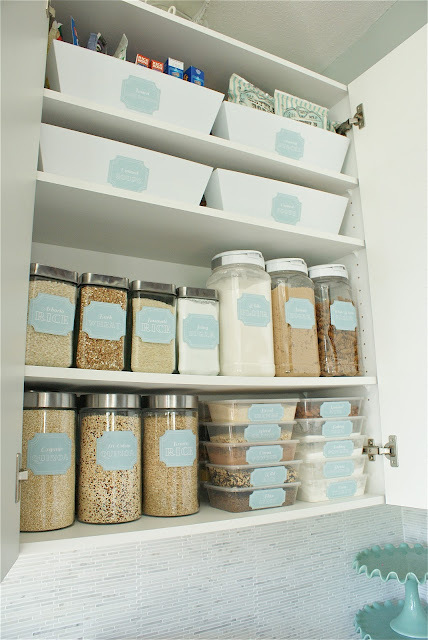 Would double stick tape work for the pantry? Hi Rebecca- thanks for the idea! I worry that the mod podge would smudge the ink though.... how do you make your bookmarks? Your mod podge idea made me think of other ways to increase durability and I wonder if spraying a coat of clear coat on the labels would help? I might have to try that this week! Thanks for stopping by! For my bookmarks I design them in Adobe InDesign, and print them on my inkjet printer onto white card stock. I then coat them with 2 or 3 coats of Modge Podge which makes them more durable and just generally tougher. I haven't had any issues with smudging... but you never know eh? The one thing I do find is that after a long time they begin to curl a bit. And maybe the fridge humidity might make that worse? The clear coat is a good idea though - I love that stuff. Thank you for giving the dummy version of how to do these things!! I get so intimidated by DIY things like this. But you make me think I can actually do them! So thank you! Am I missing something or did you not mention using a laminator? That would involve having either already owning one or to purchase one! Love your labels though, opened mine up in Illustrator and changed colours and words around! Hopefully one day I'll get around to actually applying them to the square glass containers, like yours, I already have. ANDDDDD I'm going to hit up Dollarama tonight while grocery shopping. FINALLY, a perk to being Canadian! woop woop!! Thanks Jen! 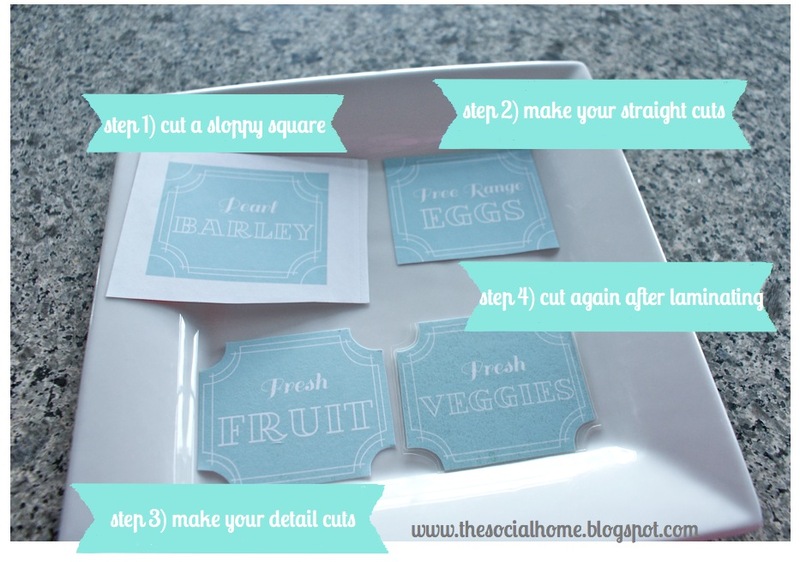 Your blog is part of my favourites now, and I've pinned your label project! 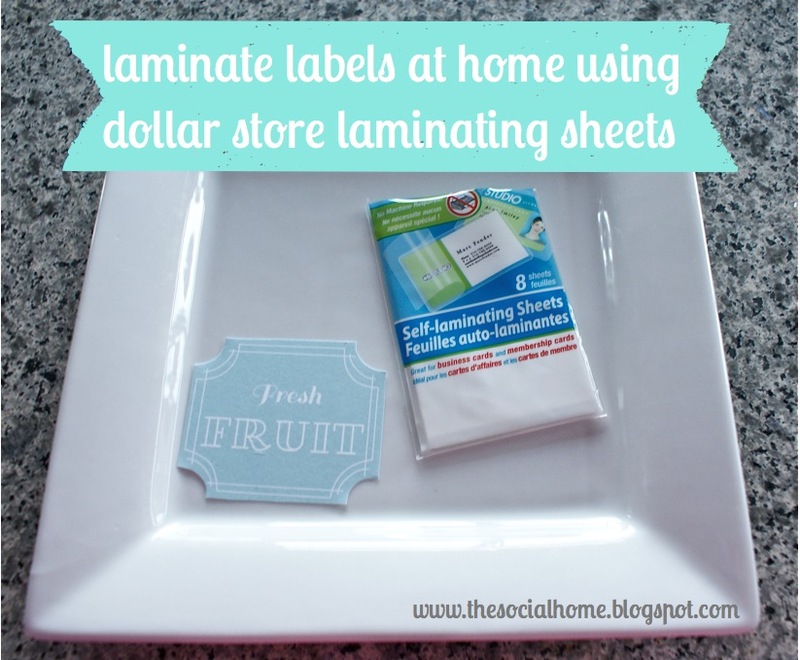 I just used self laminating sheets from the dollar store (essentially plastic sheets that stick together) so no laminator was involved! Would love to see your tweak of my labels! Send me an email or post it on my facebook page! My kitchen is similar to yours, I have white cupboards, brown walls, brown/beige horizontal glass tiles and I couldn't for the life of me figure out an accent colour to go with brown and white. Enter your beauty seafoam green labels! I bought Krylon Catalina Mist (and found their CMYK colour!!) over the weekend and that's my new accent colour. SO, THANKS!! Once I've got some projects done, I'll definitely send you some photos. Thanks again! Looking forward to some more posts to read! If you cant find self laminating sheets, clear packing tape works wonderfully! Just place on front, and on on the back making sure to stick the sticky sides together around your Manley, then cut away! 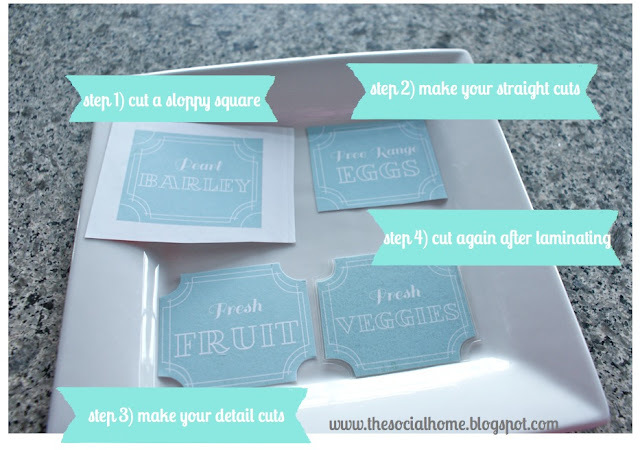 Works great for making things dry erase too! Its really fantastic post. I really enjoyed the post and found good information here. These type of labels prove to be very useful in identifying the item easily.